Implementation Process｜Manufacturing and Cost Management System's Ammic. The ERP implementation is not an easy task. However, AMMIC has established a method for smooth introductionto the sales person and the SEs who knows the manufacturing site well. 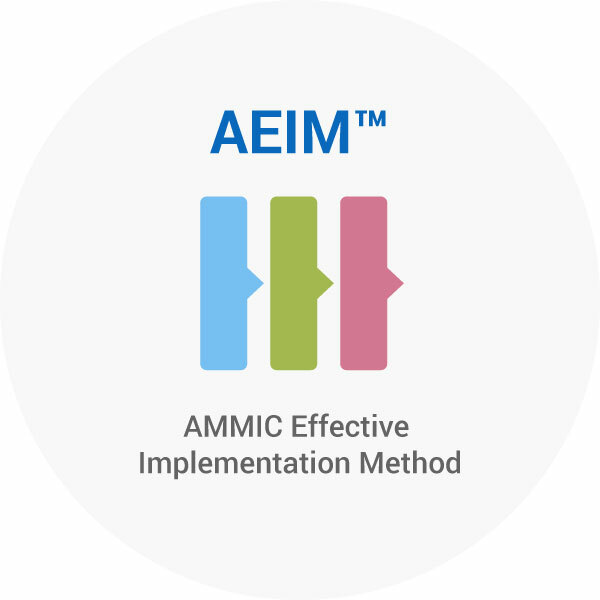 This is called the "AEIM™" (AMMIC Effective Implementation Method). Let us introduce the business negotiation flow up to the implementation flow of AMMIC after contract signing. The flow from business negotiation up to the contract signing. Depending on the customer's requirement, we will propose a solution best-fit for your needs. We will gladly introduce our products to you (including general demonstration), and send you brochures and guide documents, if necessary. A sales executive will be gathering your company’s requirements as well as interview key people in your company to get an idea of your current process and system as well as the challenges your company is currently experiencing. Then, solutions will be provided based on our superior implementation experiences and will be explained to you. For the customer who are seriously considering using the AMMIC system, a demonstration may be provided using sample data borrowed from the customer (*) which will be used as demo data so you can assess if our system is fit for your organization. *NDA (Non-disclosure agreement) will be provided to ensure the protection of the demo data provided by the customer. A system proposal will be submitted to you, which also covers the system’s basic concept, package cost, the estimate of customizing cost, implementation schedule, procedures, and hardware configuration required. If required, estimate and schedule may be adjusted to fit the schedule of both parties. Inquiries and clarifications will be addressed immediately. With clear understanding and agreement, the contract will be concluded. The ERP implementation process is divided into several phases. The goal and output of each phase is clearly defined. By defining each task, the likelihood that a task is omitted or forgotten is minimized and the ERP implementation project will be lead to success. 1 Orientation for building the environment Setup the operation environment of the package, for examining its' functions and requirement definition.